A nearby alien planet six times the size of the Earth is covered with a water-rich atmosphere that includes a strange “plasma form” of water, scientists say. Astronomers have determined that the atmosphere of super-Earth Gliese 1214 b is likely water-rich. However, this exoplanet is no Earth twin. The high temperature and density of the planet give it an atmosphere that differs dramatically from Earth. “As the temperature and pressure are so high, water is not in a usual form (vapor, liquid, or solid), but in an ionic or plasma form at the bottom the atmosphere — namely the interior — of Gliese 1214 b,” principle investigator Norio Narita of the National Astronomical Observatory of Japan told SPACE.com by email. Using two instruments on the Subaru Telescope in Mauna Kea, Hawaii, scientists studied the scattering of light from the planet. Combining their results with previous observations led the astronomers to conclude that the atmosphere contained significant amounts of water. Located 40 light-years from the solar system in the constellation Ophiuchus, the planet orbits its cooler, low-mass M-type star once every 38 hours, 70 times closer than Earth is to the sun. Its close proximity means that its temperatures reach up to 540 degrees Fahrenheit (280 degrees Celsius). Six times as massive as Earth, Gliese 1214 b is less than three times as wide, falling between the Earth and the solar system’s ice giants Uranus and Neptune in size. The high temperatures of the planet may affect the hydrogen and carbon chemistry, which could produce a haze in the atmosphere. But determining if the weather is clear or perpetually overcast on Gliese 1214 b would be difficult, as differences in the two atmospheres are small. 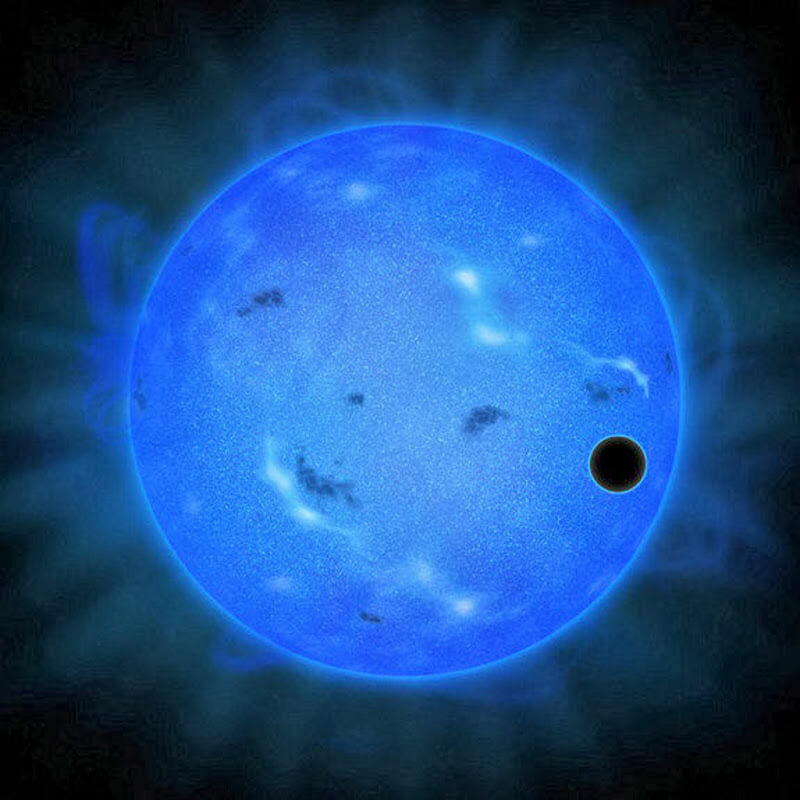 Artist’s rendition of the relationship between the composition of the atmosphere and transmitted colors of light of an alien planet. Top: If the sky has a clear, upward-extended, hydrogen-dominated atmosphere, Rayleigh scattering disperses a large portion of the blue light from the atmosphere of the host while it scatters less of the red light. As a result, a transit in blue light becomes deeper than the one in red light. Middle: If the sky has a less extended water-rich atmosphere, the effect of the Rayleigh scattering is much weaker than in a hydrogen-dominated atmosphere. In this case, transits in all colors have almost the same transit depths. Bottom: If the sky has extensive clouds, most of the light cannot be transmitted through the atmosphere. Unlike terrestrial planets, the super-Earth doesn’t have a solid surface, making the height of the atmosphere difficult to define. Instead, atmospheric scientists introduce a concept called the scale height, a height determined by changes in the increase or decrease of atmospheric pressure by a set amount. On Earth, the scale height is about 6 miles (10 kilometers), while on Gliese 1214 b it is three times deeper, according to Narita. Originally discovered in by the MEarth Project, which tracks more than 2,000 low-mass stars in search of planets, Gliese 1214 b was confirmed by the European Space Agency’s High Accuracy Radial velocity Planet Searcher in Chile. As a planet travels across the face of its star, or transits, it blocks the star’s light slightly, allowing scientists to determine characteristics about it based on how much the light dims. Though water is often considered a necessary ingredient for life by scientists, Narita doesn’t think that the super-Earth will be promising due to its close orbit, which lies within the star’s habitable zone, the region where liquid water can exist. Narita’s team intends to continue studying the planet with spectroscopic observations in the visible wavelength, and anticipates that other astronomers will follow.